How to Fix Broken PSD File? Photoshop Documents are commonly known as PSD files. These are the files created on a renowned image editor i.e. Adobe Photoshop. Every file that’s been created on Photoshop will take extension as .psd. It’s a native file format of Photoshop. 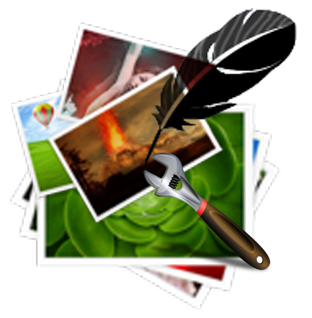 Once the photo editing task is complete, the file can be saved to various generic image formats. Most of the individuals who want to edit their images or to design an image prefer this efficient utility. At times, these PSD files get break under several terrible circumstances. Once they are broken, they don’t get accessed or open. 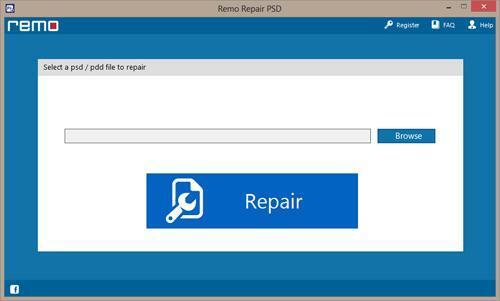 To fix broken Photoshop file, there exists a powerful repair app which is Remo Repair PSD. With the help of this repairing utility, broken or damaged PSD files can be easily within moments. 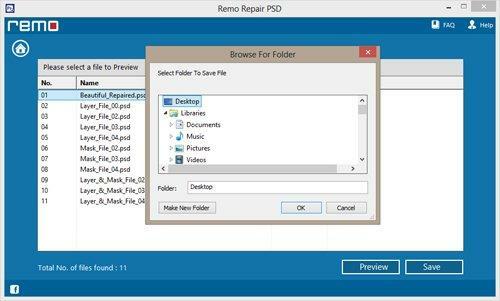 No matter to what extent they have been broken, using Remo Repair PSD they can be fixed with ease. It’s entirely unique from other tools and is non-destructive type. The application profoundly scans broken PSD file and then creates a healthy file which will be similar to original one. It can be used in various awful situations for repairing broken PSD files on computer and also includes large number of exceptional feature. Before we discuss those features, read the following points which illustrate various scenarios due to which PSD files are broken. Malware Infection: The main cause due to which PSD document breaks is infection of harmful virus. This is highly infective agent and especially Windows based PC's are more prone to such virus infection. When virus is entered onto your computer, it’ll infect the file that comes to its vicinity and make them inaccessible including PSD files. Improper Recovery: If important PSD files are lost or else deleted, then it is obvious users will try to recover them using some recovery apps. At the time of recovering PSD files, if an error is occurred and process gets interrupted due to certain reasons then PSD file will be corrupted and cannot be accessed. Download Errors: Unexpected interruptions that occur while downloading PSD file from internet can also cause severe damage to PSD files and make them inaccessible. Other Causes: Few more reasons on account of which PSD file breaks are damaged header, errors while transferring, influence of bad sectors, etc. 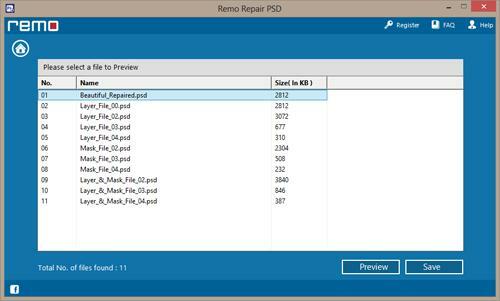 In all these above described cases, Remo Repair PSD utility comes handy for fixing broken PSD files. In a most efficient manner it is able to repair broken PSD file. 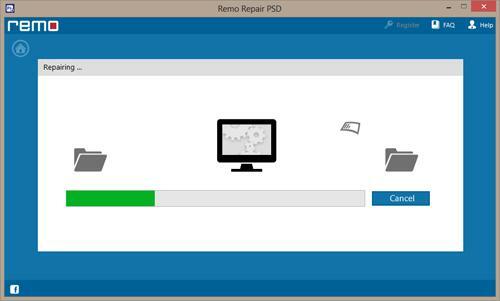 Remo PSD Repair tool can be installed in almost all major versions of Windows operating systems including Windows 8, Windows 7, Windows XP, Vista, Windows Server 2003 and Windows 2008. It can fix broken PSD on all types of secondary storage devices including flash drives, external hard disks, memory cards, memory sticks, etc. After repairing, it will restore PSD layers. It’s quite ease and simple to use, even a novice computer user can use it to repair broken PSD. This tool is capable of fixing PDD image files as well. Repairs PSD files created on different versions of Photoshop app including Photoshop 5.5, 6.0, 7, CS, CS1, CS2, CS3, CS4, CS5 and CS6. It's trial edition can be used to check out the results before purchasing the product. Step 1: Launch the app by double clicking the icon. Use “Browse” option to select broken PSD file. Click on “Repair” button to start the fixing process. The tool scans the selected PSD file and fixes it in a very short amount of time. Step 2: Through next window you can monitor the entire file repairing process. Step 3: After completion of the repair process, the healthy PSD / PDD image file along with its layers and mask files will be displayed. Use “Preview” option to preview the repaired file. Step 4: At last, save your fixed PSD file to an appropriate location of PC.